Built 1704-1705 as "Queen's Theatre" by Sir John Vanbrugh. 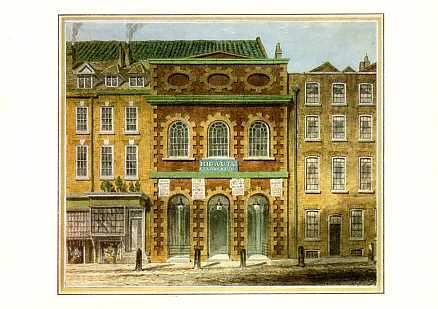 1714 renamed "King's Theatre". Destroyed by a fire in 1790. Reverse Text: "Italian Opera House (King's Theatre). Designed by Sir John Vanbrugh. Opened 1705. destroyed by fire 1789. Pencil and watercolour. By William Capon. 18cm x 21.3 cm. H. R. Beard Collection F94-14. TM 376."